Morgan Alison Stewart | BEST OF MAKEUP 2018: My Korean & Western Ultimate Favorites! 11 Jan BEST OF MAKEUP 2018: My Korean & Western Ultimate Favorites! This past year has been a whirl-wind… with all the traveling, events, exciting life moments, etc.! I’m actually still in shock that it’s over (even though we’re well into 2019 at the time of writing this). Since this video was a yearly makeup wrap-up, I also wanted to write a blog post and include links and additional thoughts. Oh and I just posted Part 2 to this series, where I discuss my favorite skincare products for the year! Now here are my favorite makeup products, both Korean and Western, for the year of 2018! These are in the particular order, in fact, I basically listed them in the order that I apply them on my face! VDL has been a long-time favorite of mine, and of course, I’ve always enjoyed the original VDL Lumilayer Primer. Because of this, I was super excited when I saw they launched their Lumilayer Primer Fresh. The main difference between this and the original formula is the undertone of the product. The original Lumilayer has a lilac, violet undertone while the Lumilayer Fresh has a gold undertone. I find this new primer suits my skin tone better and is more flattering for me personally. This is one of those fool-proof type of products. I try a lot of different eyebrow products but always find myself coming back to this. The reason I really love this Etude House Drawing Eye Brow is because of the shape of the pencil, the smooth formula, and the color of the product. It works so well for me and I love how pigmented this is. I think this would work well for those of you who don’t have a lot of brow to work with as well and this brow product, in particular, comes in 7 different shades so you’re bound to find one that fits you perfectly! I fell in absolute LOVE with this while I was traveling this past year. To be honest, when I first received this product, I thought it was going to be limited and only offer a small amount of looks. Due to the fact that it’s small and compact, I threw it into my travel bag and used it while I was away working events. That’s when I discovered how much this little palette can do! I can get several looks out of it and the shades are generally colors I gravitate towards. I love that it’s compact, pigmented, and easy to work with! I wanted to pick my favorite single eyeshadows for the year of 2018, so naturally I had to pick the Etude House Look an my Eye Eyeshadows. These are always a favorite of mine because unlike a lot of other Korean eyeshadows, these are pigmented and come in a TON of shades. They’re also constantly launching new shades with their new collections! The formula of these are pretty consistent and are easy to blend, smooth, and pigmented. I like to depot mine and put them in these palettes! 2018 was definitely the year of glitter! I was on the hunt for some awesome liquid glitters so I could rock this look! I’ve tried so many liquid glitter eyeshadows this year and these are my favorite so far. They’re ultra glitter-y, but not chunky, and they don’t have a ton of fallout through the day. I’m hoping they launch more shades because at the moment, there are only 5: Laser Eye, Nuclear Pretty, Honey Gaze, Cute Power, Tear Storm. I don’t think this is a surprise to anyone. I’ve been a big fan of this eyeliner for a while because it’s easy to work with, long-lasting, and super dark. I mentioned this in the video, but I find the recent liners I’ve bought have been a bit inkier than I remember. Nevertheless, this is still one of my favorite liners! I have a full video review of this on my channel as well as a full Beauty Battle Breakdown of Korean Pen Liners! If you’ve tried these gel pencils liners, I’m sure you can also attest to how great these are. Urban Decay does a great job with these pencil liners because they’re smooth, they last all day, and they come in a variety of fun colors. When it comes my eye makeup, I tend to be fairly tame compared to other beauty bloggers. These are how I level up my eye game. I literally pick a bright color and glide it on top of my existing liner. It’s a super easy way to add a pop of color and I always get compliments on my makeup whenever I do this! Lashes, lashes, lashes! I love me some false lashes! This past year, I’ve tried a lot of false lashes because I like to wear them for videos or events. These eyelashes from Velour are the best! I’m not a big fan of the type of false lashes that look like they can generate their own wind power, so these are perfect for me! I can find natural-looking ones that fit my eye shape and they’re fairly light (although they do have more bold ones but I stick to the lighter ones)! These are definitely more “investment” lashes because they are more pricey than say, Ardell lashes, but they last a lot longer. I can get 10-12 wears out of each lash, and probably more if I were more gentle with them. Ah, another VDL product. This foundation was a pleasant surprise for me. I randomly picked this up from Yesstyle on a whim because I noticed they had more shades and undertones available than other standard Korean foundation. This foundation has great coverage, a beautiful finish, and lasts the entire day. I also really appreciate that this foundation matches my skin! 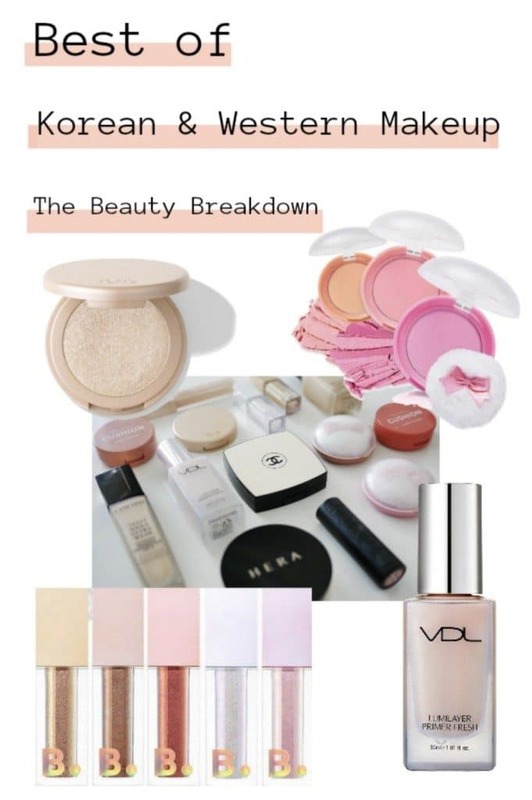 If you’re familiar with Korean makeup, you know this can sometimes be difficult to find! This has been another exciting find for me in 2018! I realize this foundation has be out for quite some time, but I hadn’t tried it until last year. This is pretty similar to my feelings towards the VDL foundation above. It has nice coverage, a nice finish and this looks nice on my skin all day. I have been using this foundation daily and I’m actually getting close to finishing the entire bottle.. which for me is unheard of! The Hera Black Cushion was easily my favorite cushion of 2018. I first saw it at Seoul Fashion Week back in 2017 but didn’t try it until the beginning of 2018. Again, since I traveled a lot in 2018, I found myself reaching for this because cushion foundations are super convenient. This foundation is absolutely beautiful! I love how easy it is to work with, it has a gorgeous finish, and the shade matches me perfectly! The Missha Cover Maestro Tip Concealer is another product that I’m close to completely finishing. This is a multi-purpose concealer meaning I can use it under my eyes, on my pimples, and on hyper pigmentation spots. It’s a smooth and creamy concealer and doesn’t dry out on my skin… hallelujah! I’ve known about this powder from Banila Co for quite some time. Why? Because I picked up this product back in 2015! Then, it made it’s way to the back of my powder drawer and I forgot about it. Last year, I found it and decided to give it a go again. I know, it’s not the best thing to do, but I was curious! After I realized I liked it, I bought a new one and haven’t set it down since! This powder works so well on my dry skin and doesn’t go patchy on me. It’s been the solution to all my powder woes when it comes to applying makeup on my dry skin! My only complaint is that this is NOT flash-friendly. I’ve worn this to a couple events and immediately noticed the flashback under my eyes in the pictures. Whoops! I have 7 of these because I love these blushes so much! These Lovely Cookie Blushers from Etude House are smooth and not powdery at all. True to Etude House form, they also come in a lot of shades and colors. These blushes are nice in particular because they are a sweet wash of color. I don’t like to get too crazy with my blushes because that typically overwhelms my look, so I like to keep it calm and natural. Another thing I want to add is that these actually show up on my skin, unlike some other Korean blushers. Of course, I don’t use the super light shades, but I can find the perfect colors for me within this line. My main complaint with these is the packaging! It’s super cute, yes, but takes up SO much room. I’m actually thinking of de-potting mine and putting them in a palette! If I’d like to opt for a dewier look, I go for these cream blushers from Aritaum. I bought my first one of these back in 2015 and since then, I’ve been slowly adding different colors to my collection. Again, these are a subtle wash of color, but also maintain their glow without sliding around on my skin. I typically use these in the winter time, when I want to give my skin more of a glow. I’ve used these in several videos, including my Glazed Skin tutorial, so be sure to check that video out if you’d like to see these in action! This highlighter is one of those products that I totally understand the hype around. When I’m looking for that “Instagram-glow”, I always reach for one of these. The powders, themselves, are absolutely gorgeous and I’m in love with the look they give me. These are not for the faint of heart and almost give you a reflective highlight. I literally just tap my brush on the top of the powder and glide it across the top of my cheeks… voila! Instant highlight! This bronzer is BUTTER. I am pretty picky when it comes to bronzer because I look for an all encompassing bronzer product; one I can use as a contour and also to add a sun-kissed look to my face. I was sent this one from Chanel and immediately fell in love. It has just enough warmth to give my skin a bit of a tan, but it’s also not too warm so I can also use it as a contour. This comes in a couple different shades as well so you can pick on that suits your skin. This is my most-used and “purse” lipstick, meaning I carry this around with me day to day. I can’t tell you how this ended up in my everyday purse but I’m glad it did. This is one of my favorite lip colors and looks great with every makeup look. I also love that it’s smooth and not super drying despite being a matte lip color. I guess technically this should’ve gone in my Favorite Skincare Products for 2018, but it ended up here. I had read about this lip balm on reddit and since I’m always on the hunt for a products to help my perpetually dry lips, I thought I’d give this a go. It’s super moisturizing and gives my lips a little glow without feeling heavy or goopy. I have a couple tubes of this now and keep on at my bedside, one in my car, one in the living room, and one in the office. Yes, it’s a bit much, but I try to keep my lips conditioned at all time! Well that’s everything! I’m sure I had more favorites during 2018 but these were products that stood out to me. Let me know down below what your favorite makeup products of 2018 were and keep an eye out for my post about my favorite Skin Care products for 2018! Cheers to more faves in 2019! !